"I met Nate several years ago, and learned of his background as a national class swimmer and world class triathlete. At about the same time, I was looking for some coaching assistance for my wife, who, as a classic overachiever, had run herself into the ground running marathons and dabbling in triathlon with her then coach. She had decided that she was more of a long distance athlete, but she was showing classic signs of over-exercise, and suffering mightily from the consequences. I asked Nate if he would be willing to coach my wife. To his credit, he asked quite a few questions before he said he would meet with her. Before he would agree to coach her, he wanted to meet and get some idea of her temperament, dedication and ability to go forward with work. Nate determined that my wife had buried herself in training and given her goal of doing well in the half IM distance, he advised that she take a year and dial back her workouts to concentrate on handling distance workouts instead of high intensity workouts. To my wife’s surprise, and complete delight, she went from an above average age grouper to winning her age group in St. George. That was supposed to be her “A” race, and Nate was able to take her qualification for the World Championship in Nevada and coach her to a 4th place finish. That was a terrific result from a woman who had trouble finishing a race without persistent pain and discomfort afterwards less than a year before. 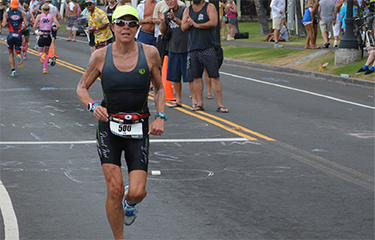 To follow up on her year digging herself out, my wife just qualified for the Kona World Championship in October (2014 – Ida placed 9th in her first IM! ), and Nate will get her there and through the event. This would never have been possible without attention to the athlete, and the sensitivity to work with an overachiever, and both bring her down to earth, and bring her up to her potential – something her previous coach was unable to do. Along the way, Nate was able to modify his coaching with appropriate humor as the situation dictated. Nate is a terrific coach. He is holistic in his approach, combining common sense, nutrition, workouts and a bit of psychology in all of his workouts. I confess that even though he is primarily my wife’s coach, I have developed a great relationship with Nate, and he is always available to help me with support for the athlete’s household, or simply basic questions about coaching theory. I have no hesitation recommending Nate for any level training, and including those athletes who demand high level quality coaching, in any of the tri-sport disciplines (swim, bike, run) as well as the ancillary disciplines, weight training and nutrition."